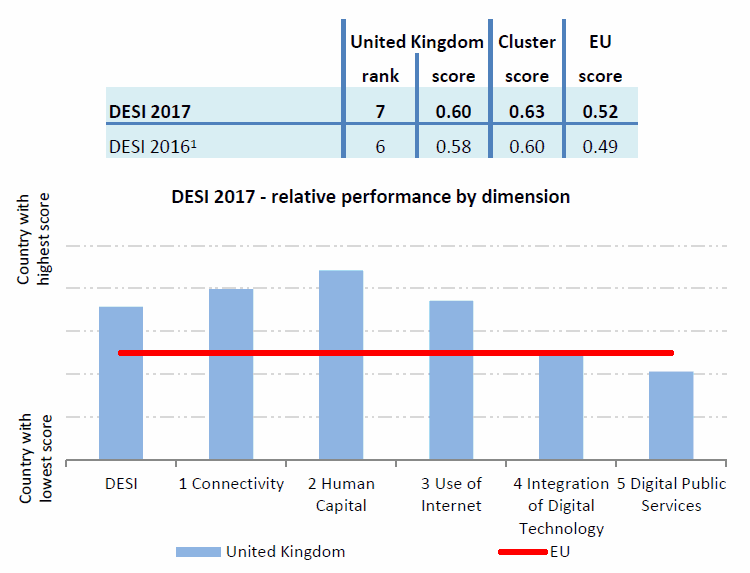 The European Commission has released their 2017 Digital Economy and Society Index (DESI), which uses data from 2016 to reveal the United Kingdom’s progress towards the EU’s Digital Agenda goals (e.g. NGA 30Mbps+ broadband for all by 2020). Sadly we’ve dropped from 6th to 7th place. On the surface this might seem like bad news but overall the UK continues to more than beat the EU average and we do better than most of the major member states. The good news is that we’re also particularly strong in the all-important area of digital connectivity, where we rank 6th overall (unchanged from last year’s report). The 2010 EU Digital Agenda goals, which among other things aimed to ensure that every home could access a 30Mbps+ capable Next Generation Access (NGA) broadband connection by the year 2020 (plus 50% subscribed to a 100Mbps+ service), actually cover much more than just Internet connectivity but our focus here mostly on infrastructure. Overall the UK coverage of 30Mbps+ broadband has increased to 92.3% (compared with 76% across the EU), which puts us well ahead of Germany, France, Italy and Spain but behind several other countries. Similarly 4G (Mobile Broadband) coverage reached 93% in the UK, which compares with 84% across the EU. Meanwhile the European Commission (note: we’re still full members of the EU for another 2 years or so) has already proposed a new “Gigabit Society” target for “all European households” to get a minimum Internet download speed of 100Mbps+ by 2025, with businesses and the public sector being told to expect 1Gbps+ (here). 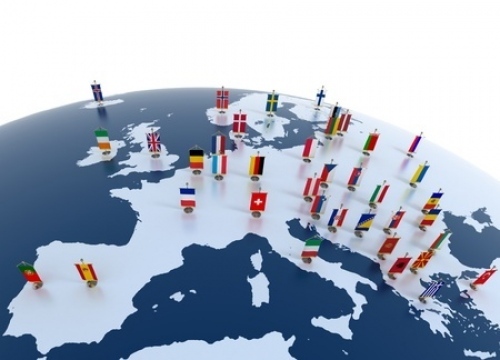 The EC’s proposal is currently still being developed and would not be mandatory, although many EU states are still a long way from achieving the original target and would clearly struggle to be prepared for the latest one. We should point out that some of the data for this report was collected during mid-2016 and as such it does not represent the most current information, although this is true for all countries in the ranking and so it’s still a useful gauge. Furthermore some data has been re-calculated since 2016 and we note that the main reason for dropping a place this year is because a few of our closest rivals are improving at a faster pace. We’ve edited together a general summary of the results below. However readers should be cautious about using any of the chart tools and broadband related data on the EU’s Digital Single Market page because most of those are still using the information from last year’s (old) report. We expect them to be updated before the summer. I think it’s worth highlighting the difference between the fixed line connectivity index ranking and that for mobile. 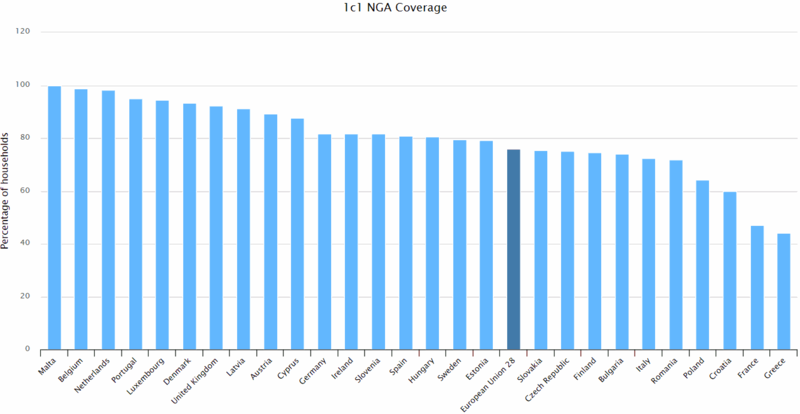 For mobile, the connectivity index places the UK #10 whils in fixed BB it ranks #3 (headed by Luxembourg and the Netherlands).